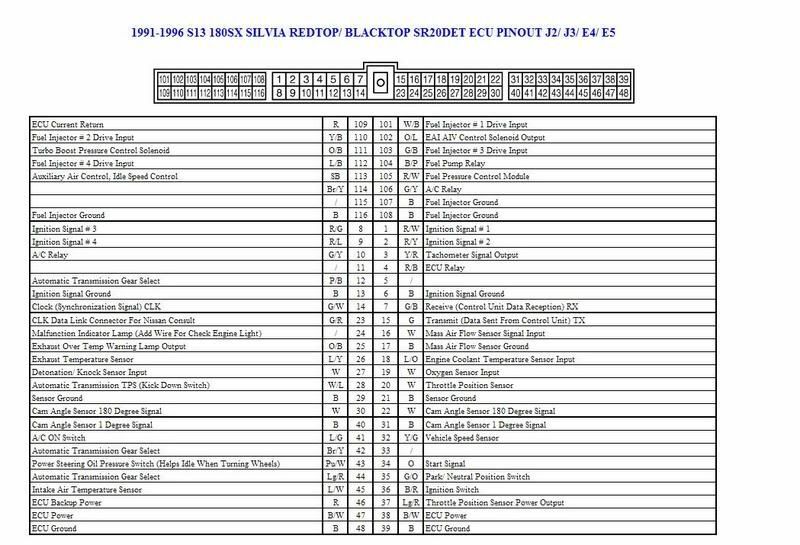 I’ll be collecting my notes on wiring AC that has been installed on an SR20DET in my S13 (1990). When the A/C is on, your ecu needs to bump up the idle to compensate for the extra load. One of the blue/green from S13 harness? - Thermo Control Amp? This will get the ecu to turn on AC mode, kick up the IACV and turn on the AC fan. 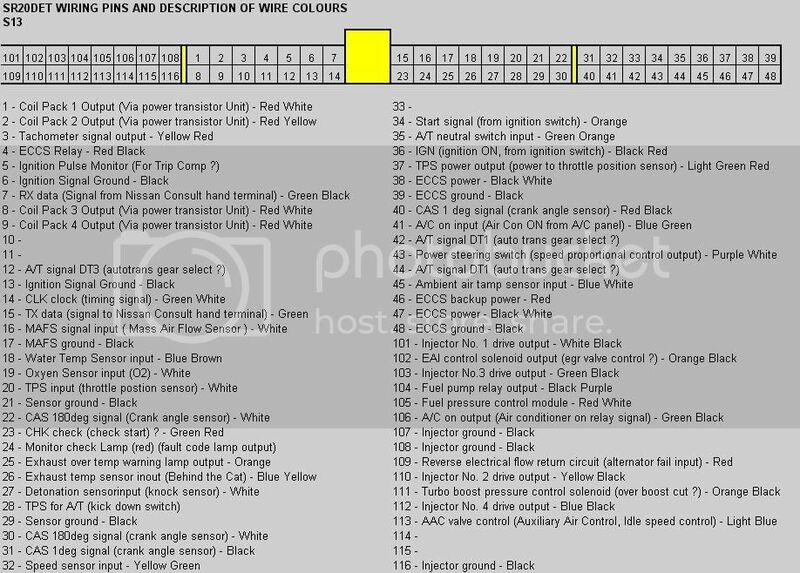 Connect pin 16 (yellow/ black from Body Harness) to pin 46 (black/pink from Body Harness) and pin 41 (blue/green from ECU Harness). This is what I did, except I spliced in the wires for the IACV and the hi/lo fan. This us using the KA compressor. “Avoid using solvents that leave residues: like the aromatics [toluene, xylene]. Use electrical parts cleaner or Windex and a Q-tip to gently scrub the wires clean. Acetone, methelyene chloride or chloroform will also work well. (NOTE: It has been said that carburetor cleaner is too harsh to use). Note: The Q-tip method is recommended only when the sensor wires are really dirty and simply spraying cleaner on them will not clean them. Be very careful when using a Q-tip! Use a Q-tip and gently scrub the wires. set digital volt meter to 20 volts DC..
1. measure from the positive battery POST to the negative battery post.. 14.1 to 14.8 volts is expected. 2. measure from the Negative battery post to the engine block… 0.04 volts is expected..
3. measure from the negative battery post to the body…………………… 0.02 volts is expected. 4. measure from the ENGINE BLOCK to the BODY …………………………. 0.02 volts is expected..
if you get 0.00 on test 2, 3, 4.. change the meter setting to 2 volts DC and retest 2, 3, 4..
if you get more than the 0.04 or 0.02 volts… you have a bad ground between those parts.. a little over can be do to an undersized ground wire..
this test takes about 2 minutes to do.. including the time it takes to get the volt meter out.. it will find all the gremlins.. save your hours of work chasing ghosts..
why spend this two minutes.. to avoid come backs.. to avoid hours of trouble shooting that gets you nowhere..
electrons flow from negative to positive..
battery negative to the engine block.. this is a battery cable usually 4 or 6 gauge…..
battery negative to the body of the car.. this is thinner.. usually 8 or 10 gauge..
engine block to the body.. usually at the firewall… this is also usually 8 to 12 gauge.. usually braided so its flexible.. but not always..
if you don’t have a good ground between the various parts.. when loads are applied.. there may not be enough electrons flowing through the ground connection to power the circuit..
your digital volt meter will read the difference in voltage between where you test at.. if there is a load on the circuit being tested.. you can with your digital volt meter.. measure the ends of the circuit and any difference in voltage will be displayed.. this helps you as if you get the 0.04 or 0.02 volts you know the circuit is working properly as there is a tiny amount of voltage drop… if you get 0.00.. change the meter setting to a 2 volts DC scale and retest..
if there is a problem with the ground circuit.. you are going to get more than the 0.04 or 0.02 volts.. i got 8.5 volts on one chevy truck between the engine and the body.. cleaned the various ground connections. and fixed many of the problems..
why test the battery voltage.. if you don’t get the 14.1 to 14.8 you know you have a positive side problem.. or an charging system problem..